Allowing you to enjoy a faster broadband connection, within our expansive collection of high performance Linksys routers, you will find routers that are ideal for high Internet usage and moderate Internet usage at home or work. Within our Linksys routers product range, you will find a wide choice of models including the Linksys WRT1900ACS Wireless Cable & Fibre router - AC 1900, Dual-band, the Linksys EA9500 Wireless Cable & Fibre router - AC 5400, Tri-band, the Linksys EA8300 Wireless Cable & Fibre router - AC 2200, Tri-band and the Linksys EA7500-UK Wireless Cable & Fibre router - AC 1900, Dual-band. Utilising advanced technology in order to connect multiple devices simultaneously with ease, our impressive range of Linksys routers will not only allow you to enjoy optimum internet usage speeds, but they also provide optimum protection for your family and friends, allowing them to use the internet safely. This is because all of our Linksys routers features WPA2 and 128-bit AES encryption, as well as SPI firewall in order to safeguard your home network with wireless safety features. 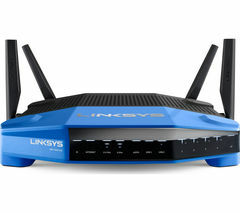 And with the majority of Linksys routers in this collection offering tri-band capability, you will also be able to access a 2.4 GHz band for simple browsing online, as well as two 5 GHz bands that offer lightning fast speeds that are equipped to stream and download large files with effortless ease. Beamforming technology is also a core feature of our routers and allows Internet users to deliver data directly to all of your connected devices. This means you will be able to reap the many benefits that come hand in hand with a stronger, and more reliable signal, which even has the capability to extend its reach to further than in your home. And if you can't find a Linksys router that is suitable for your connection requirements, don't forget to check out our fantastic collection of netgear routers and network switches.